Imagine listening to a live jazz improvisation. Moved by what you hear, you decide to try to reproduce the solo on your piano at home. To do so, you would have had to record the piece. Then you would have to listen to it over and over again, and transcribe the notes yourself. It’s a painstaking process. 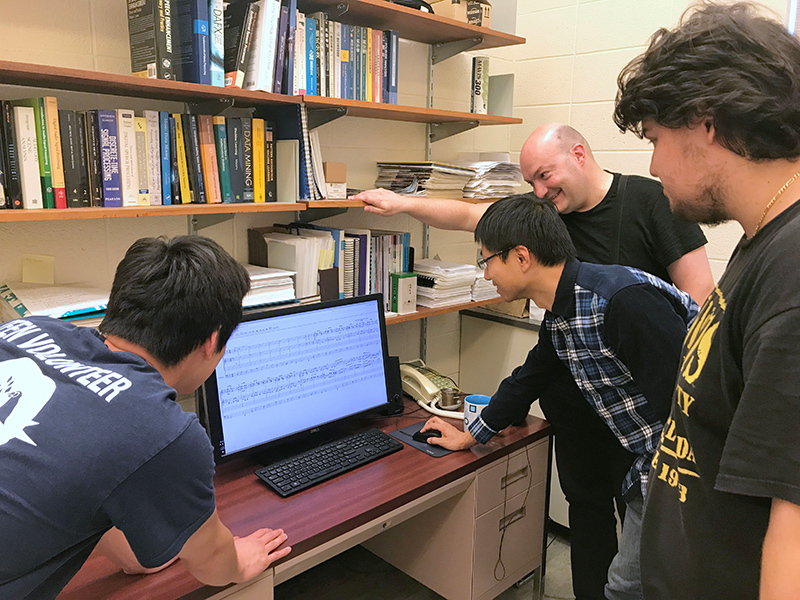 That’s one reason why Zhiyao Duan, an assistant professor of electrical and computer engineering at the Hajim School, his PhD student Andrea Cogliati, and David Temperley, a professor of music theory at Eastman, have been developing a computer program that could receive audio, extract data from it, and produce an accurate printed musical score. Fan and Smith have spent the summer creating an interface that would allow human users to fix portions of the transcription that the computer notated incorrectly and then input these changes into the computer. Using machine learning techniques, the computer would then “learn” from these mistakes in order to avoid similar errors in the future. Such an automatic music transcription program would help advance music education, retrieval, and research. For example, it would allow users to notate music for which a score is not readily available or to search for music with similar melodies and chord progressions.